Built in around 1970, on Orchid Island off the coast of Taiwan, this fishing boat for flying fish, known as a Tatara, has colourful, sculpted decoration, featuring chevrons, scrolls and suns in white, red and black. 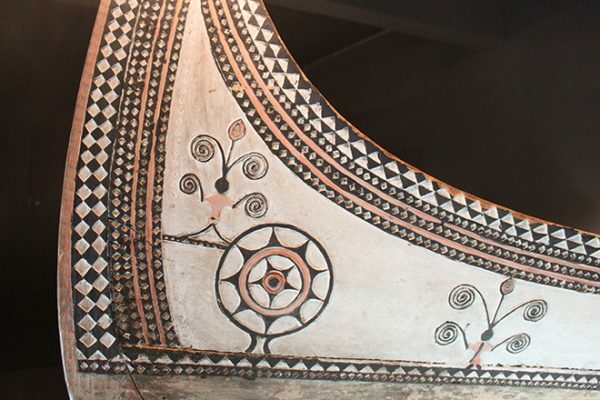 The geometric designs at the ends are the boat’s eyes. The silhouettes with scrolls show “Magomaog”, a legendary character who is said to have taught the Yamei the art of boat-building. Decorated with feathers, the ornaments that we see on the prow were only attached for ceremonies.